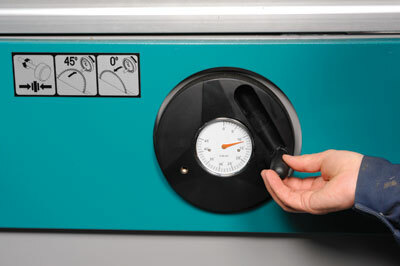 As standards in working practice and equipment increase so do the regulatory requirements used to monitor their progress. In some instances, modifying old machines is simply not a viable option, as Sussex-based machine specialist, Scott+Sargeant know only too well. Frequently faced with this dilemma they have endeavoured to come up with a solution. The iTech PS400 has been specifically designed to plug a gap in the market for large capacity machines, at the price of a second hand unit with equivalent spec. In a fiercely competitive market where European-built machines have been the dominant force for years, a new entry point has been established. Designed in Italy and built in China, there are some familiar features on the PS400 and no shortage of identical components found on other premium branded machines. It can safely be assumed now, that a quality build is no longer the sole preserve of European manufacturers. Most high-end machines come with a few luxuries intended to maximise output or increase the level of predictable accuracy. The iTech PS400 has none and for me there lies the attraction. No gimmicks, no whistles and bells, just the basics done to a good standard. 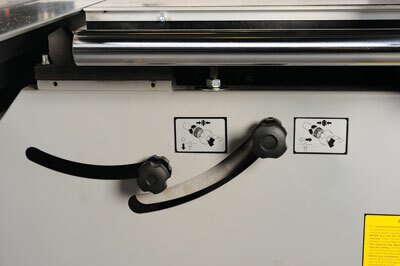 Take the sliding carriage for example; it's light on its runners and locks at regular intervals along the beam. 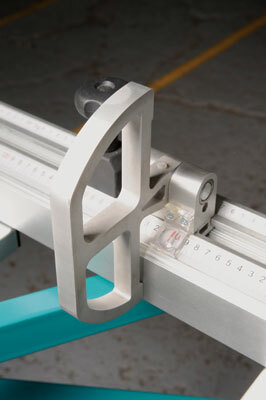 Similarly, the cross-cut support can be re-positioned by unlocking two easily accessed levers below the frame, of which some parts can be adjusted to give extra support when cutting large sections at an angle. The fence is mounted to a substantial casting with micro adjustment that runs off a 50mm diameter polished bar. 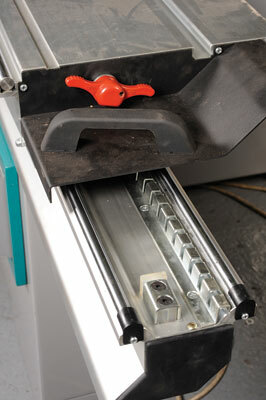 The extrusion is not that hefty, but the complete assembly locks down firmly without moving from the scale. As well as ripping a full 3.2m, the crosscut fence will also extend to the same distance. 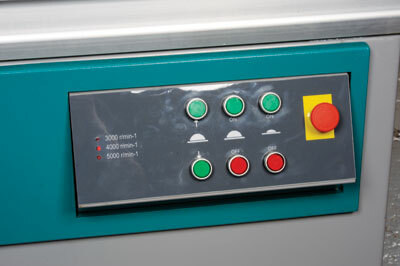 The large aluminium stops are well finished, an observation that can be extended to include the machine in general; there are no flimsy Bristol levers to break or controls that are awkward to access or operate. At the heart of the machine is a 7.5hp main motor built into an ultra-rigid trunion that hums along quite nicely. There is hardly a trace of vibration through the structure. 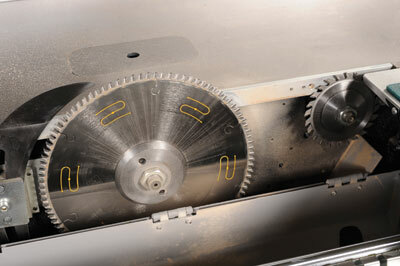 A separate motor is used to run the two-piece scoring blade. Both are easily accessed when the carriage is slid past the extraction chamber. The blades are changed by using two separate spanners. Aligning the scoring blade with the main blade is a manual affair, but again the sensible controls make this relatively simple. I may have alluded to there being nothing in the way of frills on this machine but blade height adjustments are carried out at the press of a button. Personally this is one luxury I'm prepared to pay for. Up top, the PS400 comes with a full crown guard mounted on a collapsible arm. 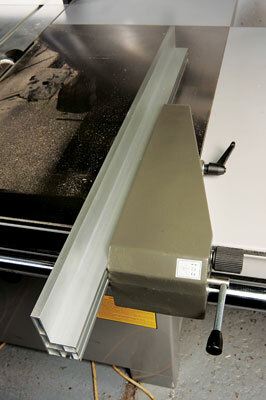 The clear guard can be lowered down to the surface of the workpiece to create an almost zero clearance. 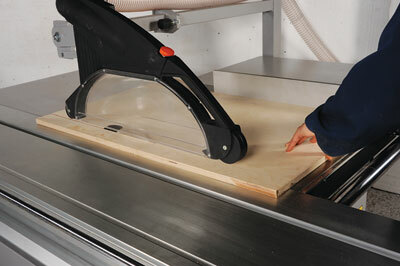 The effect is a much safer working zone and near total dust extraction. If the 300mm diameter blade appears dwarfed in our shot it's because the unit will accept a 400mm diameter blade and still allow good visibility of the working area. I searched all over for unacceptably rough edges that the operator might come into contact with throughout daily use and found only two. These were around the opening in the table that allows access to change belt positions and blade rotation speed. The current model features a wind mechanism to release tension in the belt. This is to be upgraded shortly to operate via a lever. The cast iron table surface is smooth ground with extension tables to the left and back so there is plenty of working area to support large offcuts which presumably would be your intention on a machine of this size. Not withstanding the extra distance you'll walk each day operating a panel saw of these proportions I would still favour one over a wall saw for sheer versatility. For a lot of makers a tablesaw is still at the heart of the workshop and one that will tackle full sheets, rip waney edged boards and dimension finished stock is hard to beat. With a 3.2m length of cut it is likely to be at the top end of the scale for a majority of F&C readers, but for the same price as a machine with less capacity it has got value-for-money written all over it. Sheer size puts it in the professional category with very little competition. You just need to decide how you are going to find the space for it.